The Schwinn High-Density Foam Seat for MTB is a durable and well-designed product made from a high quality Lycra material that is resistant to harsh weather conditions and features superior ergonomic properties. It comes with a deep recess in the middle that runs length-wise to provide adequate comfort to sensitive zones when seated. Provide excellent comfort via embedded extra gels. Features a cut out that runs lengthwise in the middle thereby offering protection to sensitive parts. Built with a high quality Lycra material that offers resistance to diverse weather conditions. 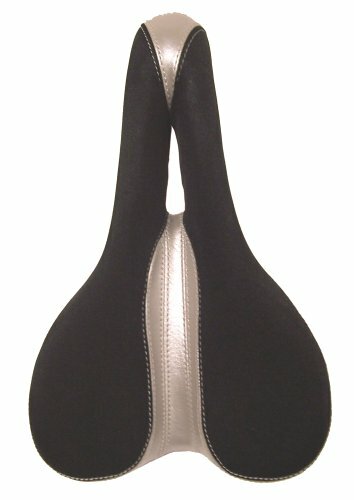 The Schwinn High-Density Foam Seat is a very affordable product that delivers quality and comfort. The seat cushions are super soft so you might feel a slight depression when you are seated and this can change your seating position, nut nonetheless its very comfy. Inasmuch as this product offers superb comfort, the durability is questionable. The fabric material covering the outer part looks very cheap, and it won’t last well with rain or sweat. The layers made from rubber looks like wants to pull off and soon enough, they will experience slight chaffing. The seat also is kind of wider than normal for a casual bike, however it suits mountain biking. The seat offers excellent bouncing that cushions part of the shock that comes from riding over rough and bumpy terrain even if you are fully seated. The cut out in the middle is a nice design that allows for proper and adequate ventilation and does not interrupt sensitive areas around the groin area. For the price, the Schwinn High-Density Foam Seat offers superb comfort and you will certain get good value for money if you invest in it.